Never have time for breakfast? If you hit the floor running every day or find it difficult to eat solids early doors, here's something that could change your mornings and stop that 11 o'clock attack on the biscuit barrel. Once a week, I make up smoothie packs for the freezer which means I always have a stand-by breakfast if I fail on the boiled eggs or porridge front. Mine contain nuts, seeds, fruit, greens and oats so I consider them a meal, the addition of chia seeds thickens the smoothie and keeps me fuller longer. 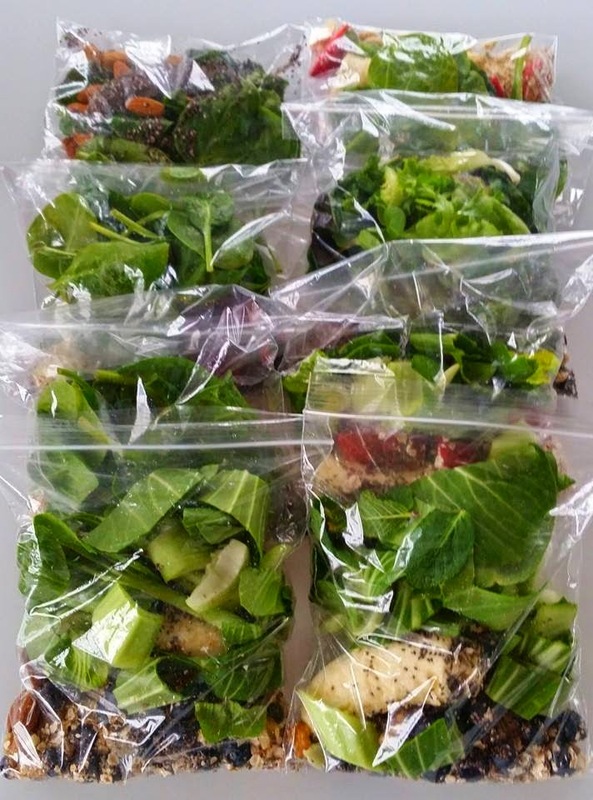 Put everything into ziplock bags, greens go in last, squeeze any air out of the bag and seal. Put them into the freezer where they will last at least a month. To make the smoothie, place in a blender with 1 1/2 - 2 cups of liquid depending on how thick you like it- I use almond or hazelnut milk and blend for 3 minutes or until it's smooth (rinse out and reuse the ziplock bags). I try and rotate the greens and fruits so that I don't have the same every day - using a mixture of spinach, kale and collard greens when they are available and raspberries, blueberries, blackberries and forest fruits is my ideal. I keep a stash of berries in the freezer (buy them when they are in the reduced section, wash and freeze) and always peel and freeze bananas if they are heading for over-ripeness before they'll get eaten. The addition of oats, seeds and nut milk balances the meal and keeps your blood sugar stable as opposed to just-fruit smoothies.